Please note: Our site contains the flag code in its entirety and dozens of answers to a very wide array of questions. We hope the information we have provided will be a useful resource to visitors. We are not expanding this section and cannot answer specific questions regarding the flag code and its interpretation. Section 8k of the Flag Code states, "The flag, when it is in such condition that it is no longer a fitting emblem for display, should be destroyed in a dignified way, preferably by burning." You can contact your local VFW Chapter and ask them for help properly disposing of your flag. Consider providing a small donation to them for their assistance. Or you can contact your local Elks Lodge (who created the idea of Flag Day, established officially by President Truman, himself a member of the Elks), the American Legion, or the Knights of Columbus. Some Boy Scout and Girl Scout troups also can provide this service. In earlier times, most American flags were made of cotton or wool. But today's flags are often nylon or other petroleum-based materials. Burning them can release hazardous gases, including formaldehydes, ammonia, carbon monoxide, and traces of hydrogen cyanide into the air. In some states, it is even illegal to burn nylon, so adhering to the Flag Code puts you in direct violation of the law. Burning is preferred for cotton and wool flags. Nylon and flags made from other synthetics can be buried. What is the History of the Flag Code? Beginning in the late 19th century, the use of the flag on beer bottles and other products led to a movement to protect the flag from commercial use. Efforts at the federal level failed, so states, one by one, started passing their own Flag Codes, beginning with Illinois, Pennsylvania and South Dakota. In the case of Halter vs. Nebraska (1923), the Supreme Court ruled 8-1 that state governments have the authority to ban desecration of the American flag. Several efforts followed trying to unify the various state codes into one Federal Flag Code, which occurred in 1942 (see above). The American Legion has been promoting flag etiquette since its founding in 1919. The Veterans of Foreign Wars has long advocated proper respect for the flag. Adoption of State Flag Desecration Statutes — By the late 1800's an organized flag protection movement was born in reaction to perceived commercial and political misuse of the flag. After supporters failed to obtain federal legislation, Illinois, Pennsylvania, and South Dakota became the first States to adopt flag desecration statutes. By 1932, all of the States had adopted flag desecration laws. Publicly mutilating, trampling, defacing, defiling, defying or casting contempt, either by words or by act, upon the flag. Under the model flag desecration law, the term "flag" was defined to include any flag, standard, ensign, or color, or any representation of such made of any substance whatsoever and of any size that evidently purported to be said flag or a picture or representation thereof, upon which shall be shown the colors, the stars and stripes in any number, or by which the person seeing the same without deliberation may believe the same to represent the flag of the U.S.
Are there recent changes to the Flag Code or flag rules? Public Law No: 111-41 modifies the Flag Code to encourage the display of the flag of the United States on National Korean War Veterans Armistice Day. Public Law No. 110-239 modifies the Flag Code to encourage the display of the flag of the United States on Father's Day. Public Law No. 110-181 changes section 9 of title 4, permitting members of the Armed Forces and veterans who are present but not in uniform to render the military salute. (Note that this change was opposed by the American Legion). Public Law No. 110-41 authorizing Governors to issue proclamations to half-staff the flag upon the death of a member (from that state) of the Armed Forces who dies while serving on active duty. Are there penalties for violating the Flag Code? No. For private citizens, the Flag Code serves as a guide to be followed on a purely voluntary basis to insure proper respect for the flag. The Supreme Court has ruled that politically motivated violations of the Flag Code are protected by the First Amendment. The Flag Code has no provision for enforcement. No fines, no penalties. There is nothing law enforcement can do when the Flag Code is broken. Are flags on T-shirts, ties, etc., really flags? Yes. According to the Flag Code, a flag is anything "by which the average person seeing the same without deliberation may believe the same to represent the flag." The words "flag, standard, colors, or ensign", as used herein, shall include any flag, standard, colors, ensign, or any picture or representation of either, or of any part or parts of either, made of any substance or represented on any substance, of any size evidently purporting to be either of said flag, standard, colors, or ensign of the United States of America or a picture or a representation of either, upon which shall be shown the colors, the stars and the stripes, in any number of either thereof, or of any part or parts of either, by which the average person seeing the same without deliberation may believe the same to represent the flag, colors, standard, or ensign of the United States of America. Therefore, a flag includes any representation of it of any substance, with stars and stripes of any number. This would include T-shirts and ties. The Flag Code states that the flag should never be worn. (Section 8d): "The flag should never be used as wearing apparel." How should I dispose of T-shirts with pictures of the flag on them? Because the T-shirt is, according to the Flag Code, indeed a flag, it leads to the somewhat absurd conclusion that it needs to be retired in a dignified way. See My flag is old and ready to be retired. What should I do? Is it okay for an advertisement to use the flag? No. Section 8i of the Flag Code reads, "The flag should never be used for advertising purposes in any manner whatsoever." The earliest drafts of the Flag Code were in response to the use of the flag in advertisements and on packaging, especially for beer. Read more. Can I fly my flag at home 24 hours a day? Yes, provided it is "properly illuminated." The Flag Code offers no additional guidance on what "properly illuminated" means. We interpret it to mean that there should be either a light directly upon the flag or that there be sufficient local lighting to make the flag visible at night. If you cannot "properly illuminate" your flag, the Flag Rules specify that you should retire it at sunset. The American Legion defines proper illumination as a "light specifically placed to illuminate the flag (preferred) or having a light source sufficient to illuminate the flag so it is recognizable as such by the casual observer." Is it appropriate to fly a flag that has fewer than 50 stars? Yes. Official United States flags are always considered living, active flags. From the Betsy Ross flag to the present 50-star flag, any flag that at some time was the official flag is still considered a living flag to be accorded all due respect. Should I fly my flag today? Martin Luther King Jr.'s birthday, 3rd Monday in Jan.
Washington's Birthday, 3rd Monday in Feb.
Columbus Day, 2nd Monday in Oct.
Thanksgiving Day, 4th Thursday in Nov.
» See Should I fly my flag at half-staff today? According to the Flag Code, Americans should stand at attention facing the flag with the right hand over the heart. When not in uniform men should remove any non-religious headdress with their right hand and hold it at the left shoulder, the hand being over the heart. Persons in uniform should remain silent, face the flag, and render the military salute. Those who are not U.S. citizens should stand at attention. What do the colors red, white, and blue of the American flag symbolize? Why do we stand and put our right hand on our hearts when we say the pledge of allegiance? And where did this tradition originate? The original Bellamy salute, first described in 1892 by Francis Bellamy, who authored the original Pledge, began with a military salute, and after reciting the words "to the flag," the arm was extended toward the flag, palm-down. Where do you wear a lapel flag pin? Lapel flag pins were in the news during President Obama's campaign in 2008. Should the American flag be taken down during a rain storm? Most flags sold nowadays are all-weather flags (refer to the packaging). These are permitted to fly during inclement weather, according to the Flag Code. Is it proper to wash or mend a flag? Yes. If a flag is torn, it can be repaired, preferably by a professional or someone skilled in mending. If it is dirty, it can be washed, preferably by hand with a mild soap. If it is faded or tattered beyond repair, or dirty beyond cleaning, then it is time to replace the flag. Any flag that is tattered on the fly end can be repaired if the stripes (cut off where the tatter begins) are still longer than the field. If you fold the flag in half and the field overlaps the frayed fly, then it is time for a new flag. Many dry cleaners will clean your flag at no cost. Ask your local cleaner their policy on cleaning flags. What music is played raising and lowering the flag? Flash Player required to use this player. The traditional bugle call for raising the flag is Reveille. On the first note, you begin to briskly raise the flag, which should take about 20 seconds. The traditional bugle call for U.S. civilians lowering the flag is "Taps." In the military, they play "Retreat," then a gun is fired (if available), followed by playing the national anthem or "To The Color" (either live or recorded) and the flag is slowly lowered, completed with the final note of music. The Army plays "Taps" at funerals and as the last call of the night. "Taps" was composed by the Union Army's Brigadier General Daniel Butterfield while in camp at Harrison's Landing, Virginia, in 1862, to replace the more formal "Tattoo" (lights out). It is called "Taps" because it was often tapped out on a drum in the absence of a bugler. It was used by both Northern and Southern camps. The call was officially adopted by the U.S. Army in 1874. What are the rules for color guards? Can the American flag be used as the background for a bulletin board display with notices tacked on it? No. According to the Flag Code, Section 8g: "The flag should never have placed upon it, nor on any part of it, nor attached to it any mark, insignia, letter, word, figure, design, picture, or drawing of any nature." Section 8: "No disrespect should be shown to the flag of the United States of America." Section 8j: "The flag represents a living country and is itself considered a living thing." There is a law protecting your right to fly the US flag. A condominium association, cooperative association, or residential real estate management association may not adopt or enforce any policy, or enter into any agreement, that would restrict or prevent a member of the association from displaying the flag of the United States on residential property within the association with respect to which such member has a separate ownership interest or a right to exclusive possession or use. Read HR42. Is it okay to use flag napkins or flag paper plates? No. Section 8i of the Flag Code reads: "It should not be ... printed or otherwise impressed on paper napkins or boxes or anything that is designed for temporary use and discard." This picture posted by Kraftfoods as a Fourth of July recommendation. They also provide a recipe for a flag cake. 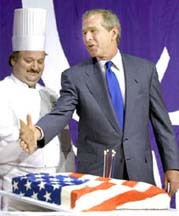 Is a cake decorated with a flag drawn with icing a violation of the Flag Code? "... It should not be ... printed or otherwise impressed on ... anything that is designed for temporary use and discard." The icing on a cake would generally be eaten, digested, and "discarded" in a most disrespectful way. We suggest that it is an inappropriate display of the flag. What does the gold fringe on the flag represent? Gold fringe can be found on ceremonial flags used indoors and for outdoor ceremonies. The fringe is considered completely within the guidelines of proper flag etiquette. There is nothing in the Flag Code about the fringe being for federal government flags only. The Internet contains many sites that claim that the fringe indicates martial law or that the Constitution does not apply in that area. These are entirely unfounded (usually citing Executive Order 10834 and inventing text that is not part of the order) and should be dismissed as urban legends. Others ascribe meanings of spiritual authority. Gold fringes on flags goes back long before the United States. Flags in ancient India had gold fringe, as did those in France, England, and throughout Europe. How can I get a flag that has flown over the Capitol? Constituents may arrange to purchase flags that have been flown over the Capitol by getting in touch with their Senators or Representative. A certificate signed by the Architect of the Capitol accompanies each flag. Flags are available for purchase in sizes of 3'x5' or 5'x8' in fabrics of cotton and nylon. Can I have people sign my flag? No. You should never sign the flag directly on it. If your flag has a canvas strip that holds the grommets, it is acceptable to have everyone sign along that canvas strip. Or, you can have everyone sign a separate document that can then be framed and displayed with the flag. I am thinking of getting a flag tattoo. Is it okay? There is nothing in the Flag Code specifically about tattoos. However, it would be difficult if not impossible to strictly adhere the flag code with a flag tattoo. For example, tattoos fade with time and can be marred by scars. Faded and damaged flags should be reverently destroyed. This would present considerable difficulties with a flag tattoo. Is Texas's the only state flag allowed to fly at the same height as the US flag? No. This is an urban legend. All state flags may fly at the same height as the U.S. flag. The U.S. flag must be on its right (the viewer's left), however. Texas's laws are consistent with those of the other states. Does the ball ornament atop a flagpole contain a razor, lighter, and flare? No. This is just an urban legend. One explanation is that the myth started during the Cold War and that the objects were to be used to destroy the flag in the event of a Soviet invasion. Of course, the ball ornament predates the Cold War by many years. Where does the flag fly 24 hours a day? Section 6a: "when a patriotic effect is desired, the flag may be displayed twenty-four hours a day if properly illuminated during the hours of darkness." Presidential Proclamation No. 2795, July 2, 1948. Public Law 83-319, approved March 26, 1954. Presidential Proclamation No. 3418, June 12, 1961. Public Law 89-335, approved November 8, 1965. Presidential Proclamation No. 4000, September 4, 1970. Presidential Proclamation No. 4064, July 6, 1971, effective July 4, 1971. Presidential Proclamation No. 413 1, May 5, 1972. Public Law 94-53, approved July 4,1975. When children paint the American flag, is that against the Flag rules and regulations? Respectfully featuring the American flag in artwork is a wonderful thing and should be encouraged. We would hope that the artwork is preserved and displayed proudly by the young artists and their families. Isn't the American flag stamp in violation of the flag rules? The answer appears to be yes. Section 8e. of the Flag Code reads, "The flag should never be ... used ... in such a manner as to permit it to be easily torn, soiled, or damaged in any way." Section 8g. reads, "The flag should never have placed upon it, nor on any part of it, nor attached to it any mark ... of any nature." 8i. reads, "[The flag] should not be printed or otherwise impressed on ... anything that is designed for temporary use and discard." At the beginning of a scout meeting, when the Flag is brought into the room isn't it proper to salute as it is marched to the front and placed in its stand? Section 9 states: "During the ceremony of hoisting or lowering the flag or when the flag is passing in a parade or in review, all persons present in uniform should render the military salute. Members of the Armed Forces and veterans who are present but not in uniform may render the military salute. All other persons present should face the flag and stand at attention with their right hand over the heart, or if applicable, remove their headdress with their right hand and hold it at the left shoulder, the hand being over the heart. Citizens of other countries present should stand at attention. All such conduct toward the flag in a moving column should be rendered at the moment the flag passes." What state has never been under a foreign flag? Although Idaho is the common answer to this popular trivia question, it was part of the Oregon Country, claimed by both the United States and Great Britain until the United States gained undisputed jurisdiction in 1846. Therefore the correct answer is "none." I am a printer. What PMS colors are proper for the flag? In the Pantone system the colors are: Blue PMS 281 and Red PMS 193. The RGB colors are Dark red (#BF0A30), White (#FFFFFF), and Navy (#002868). Is it appropriate to use mints wrapped in a flag print wrapper at a banquet? The flag is not a decoration, it is the symbol of a living nation. It is not to be trivialized by well-meaning but thoughtless uses, such as being used as mint wrappers. What does it mean if the flag is not flying at the White House? An urban legend states that it only flies at the White House when the President is in town. According to Lonnie Hovey, Director of Preservation of the Eisenhower Executive Office Building, "Unlike other countries where the flag flying or not flying signifies the monarch or president is in the residence, the American flag is always flying on top of the White House whether or not the President and First Family are at home." Why is the flag sometimes called the colors? In formal and military contexts, the American flag is called different things depending on where or how it is displayed. For example, it is called an ensign when it is displayed on a vessel. It is called "Colors" when it is carried by foot, as by the infantry. It is called "Standard" when it is displayed on a car or an aircraft, and by the cavalry. Has the Congress always said the Pledge of Allegiance at the beginning of each day? No. That is relatively recent. The House began doing so in 1988. The Senate since 1999. In a recent Knights of Columbus ceremony, before the colors were retired, a "cap" was placed on the Eagle at the top of the flag. Where does this originate? 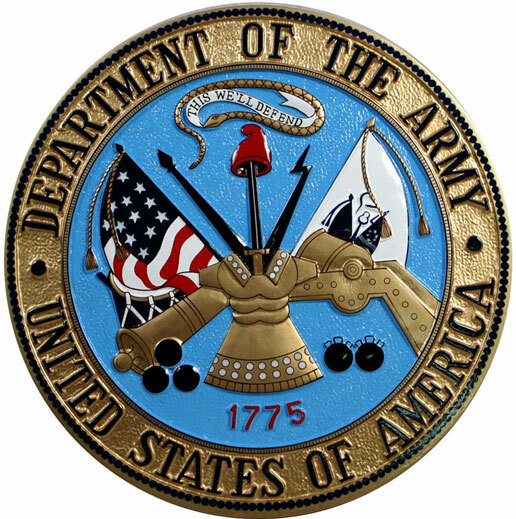 Detail of US Army Seal. Click for enlargement of full seal. It is a Phrygian cap or Liberty cap. In ancient Rome, it was given to a slave upon manumission as a sign of his freedom. In the Revolutionary era, the red Phrygian cap evolved into a symbol of freedom, in America, France, and elsewhere. The picture of Liberty on early silver dollars shows her wearing a Phrygian cap and today it is seen on the seal of the US Army (see picture). Also, those fans of cartoons will recognize it as the headgear worn by Smurfs. Is there a timeline of flag desecration issues? Yes, we have posted a Timeline of Flag Desecration Issues here. Do I have to fold my flag in the triangular fold for storage between use? No, for storage purposes, you may use the ordinary rectangular fold and, perhaps, place your flag in a plastic bag. If the flag is affixed to a staff, you may roll the flag around the staff for storage. The triangular fold is not required, but is traditional for display of the flag, often placed in a rectangular wooden display box. Any valued flag may be displayed in the triangular box. It is not exclusively for display of funeral flags. For example, if you were to get a flag that flew over the White House, you could display that in the triangular box. In the triangular fold, how many stars should be showing? What do they represent? The writer of this question continued, "I was told that 13 stars should be shown on a field of blue representing the thirteen original colonies and that the three sides of the flag represent the three branches of our goverment." The number of stars showing depends on many factors. Rarely have I actually seen 13 stars showing. However, when it happens, it is simply a wonderful coincidence. In any case, your interpretation is certainly wonderful. According to the SAR, the triangular shape is representative of the tri-corner hat worn by the Patriots of the American Revolution. What is the meaning of the folds in a flag-folding ceremony? There is no reference to meaning of the folds in the Flag Code. There are several available flag-folding ceremonies you can use. Sales tax laws differ state to state. You need to check with your own state's tax code (if it's online) or with a tax attorney for guidance. An exemption from Wisconsin sales and use tax is created for the sale of, and the storage, use, or other consumption of, the U.S. flag and the Wisconsin state flag. A flag, for purposes of this exemption, is considered to include the staff to which the flag is permanently mounted when sold by the retailer. However, if a flag is sold together with other tangible personal property, such as a pole to which the flag may be attached and unattached, and mounting brackets, only that portion of the selling price attributable to the flag is exempt from Wisconsin sales and use tax.